One lawyer who insists he does not believe in such rituals is Richard B. Lind, who played college baseball at Cornell and recalled how he and some teammates avoided stepping on foul lines because it was seen as unlucky. Now, when he has a trial, Mr. Lind said, he actively tries to dispel any hold that superstition may have on a case. In a case in 2002, a lawyer in Federal District Court in Manhattan sought a change of venue for a suspected aide to Osama Bin Laden who had been charged with stabbing a jail guard. The lawyer, Richard B. Lind, said he was convinced that his client could not get a fair trial in Manhattan so soon after 9/11. Mr. Lind had surveys conducted in New York and five other jurisdictions in January 2002. The results showed that 58 percent of New Yorkers had been “personally affected” by the attacks — from losing family members or friends to having their work disrupted — more than double the average of those in the other areas. “There is a tidal wave of public passion” in New York, Mr. Lind wrote. A reputed leader of Al Qaeda who stabbed a guard at the Metropolitan Correctional Center in late 2000 will not face life in prison when he is sentenced, a federal judge in Manhattan decided yesterday. In a 213-page opinion, Judge Deborah A. Batts of Federal District Court said the defendant, Mamdouh Mahmud Salim, who pleaded guilty last year in the stabbing, cannot be considered to have committed a crime of terrorism in the stabbing. Mr. Salim, who faces 14 to 17 years in prison, would have been liable for life imprisonment had it been found that his crime was related to terrorism. In the first trial arising from the corruption scandal in the 30th Precinct, a Federal jury in Manhattan yesterday acquitted a police officer of charges that he distributed drugs, took payments to protect drug dealers and conducted illegal searches and seizures. The case against the officer, John Arena, centered on the testimony of the Government's crucial witness, George Nova, a former police officer and admitted perjurer who pleaded guilty to drug trafficking and civil rights violations. He agreed to testify against his former partner in a bid for leniency. It was the third time in four years that a Manhattan federal jury has been asked to impose the death penalty but declined to do so. It was the second case in a year in which juries voted against death in a case where Southern District prosecutors initially chose not to seek the death penalty, but were overruled by the U.S. Department of Justice. An alleged Al Qaeda operative implicated in the bombing of U.S. embassies in Africa will not receive a life sentence for the near-fatal stabbing of a guard at the Metropolitan Correctional Center. IN FEBRUARY 1996, Cambodian refugee Malis O. Chum was arrested at JFK Airport carrying $77,452 in undeclared cash in her luggage. Despite her claims the money represented hard-earned contributions from fellow refugees to rebuild a Buddhist temple and assist relatives in their ravaged homeland, Ms. Chum was arrested. The money was seized under federal forfeiture laws aimed prinicpally at drug dealers and money launderers. Criminal charges were soon dismissed. But it has taken three years for the government to agree, yesterday, to return the money. Emphasizing the statutory presumption that certain joint bank accounts are intended to pass assets outside a will, a state appellate court has reversed a surrogate's order directing the son-in-law of a deceased Queens woman to turn over the proceeds of five bank accounts which the woman had established with her daughter, the man's late wife. After a two-week trial and two days of jury deliberations in federal court in Manhattan, Emilio Fusco, of Longmeadow, was acquitted of the 2003 Western Massachusetts murders of crime boss Adolfo "Big Al" Bruno and low-level associate Gary Westerman. The murder acquittals represented a huge victory for the defendant in context, as he vehemently denied involvement in the schemes from the start and faced life sentences in connection, if convicted. Defending accused terrorists is a pretty thankless task. Now, with lawyer Lynne Stewart’s conviction (and possible 30-year sentence) for providing material support to terrorists when she represented Sheik Omar Abdel Rahman, defense attorneys have their own freedom to worry about. Federal prosecutors will question an alleged former high-ranking associate of Osama bin Laden in Manhattan federal court Monday, as that man seeks to avoid a life sentence for stabbing and severely wounding a jail guard. Mamdouh Mahmud Salim, 45, from Sudan, pleaded guilty in April to the November 2000 stabbing of officer Louis Pepe inside the Manhattan Corrections Center, where Salim has been detained on terrorism charges for almost four years. The man who helped the fed convict Autumn Jackson for trying to extort $40 million from funnyman Bill Cosby—and then married her–dodged prison today. Antonay Williams, 27, was sentenced to five years' probation for being "an enormous asset" to Jackson's prosecution for threatening to sell to a supermarket tabloid her story of being Cosby's love child. The former Chemical Bank trader who caused $66 million in losses through unauthorized Mexican-peso trading is facing a prison sentence of 37 to 46 months, a federal judge said. The prospective sentence for Victor Gomez, who has pleaded guilty to causing the losses, would be a lighter one than had been expected: under federal sentencing guidelines, he could receive as much as 5 1/4 years in prison. 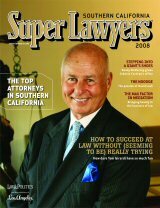 Richard Lind chosen as one of the "seriously outstanding" lawyers in the New York area by Super Lawyers magazine. Only the top 5% of the city's lawyers were bestowed this honor and Richard Lind was one of the few criminal defenders on the list. Copyright Richard B. Lind, Esq. All rights reserved. Photo by Wallyg via Flickr.